More than one week after the not-quite-a-break-in-kind-of-robbery, I still noticed that I was a little jumpy. A plastic bottle rolled off the table onto the floor – and I jumped. Something fell in the garden outside – and I recoiled. The metal gate doors rattled from a worker (I later realized) who’d bumped into them while bypassing a fellow worker on his motorbike – and I froze. The clairvoyants had not yet been consulted (as far as I know), the police largely unreliable, and it was clear that the neighbors and laborers won’t fib on one of their own. It was time for me to put this episode behind me, reclaim my space and lose those jitters. As if to answer my wishes, giggly and smiley Ayu walked in this morning, with a large woven basket in her arms… full of offerings. 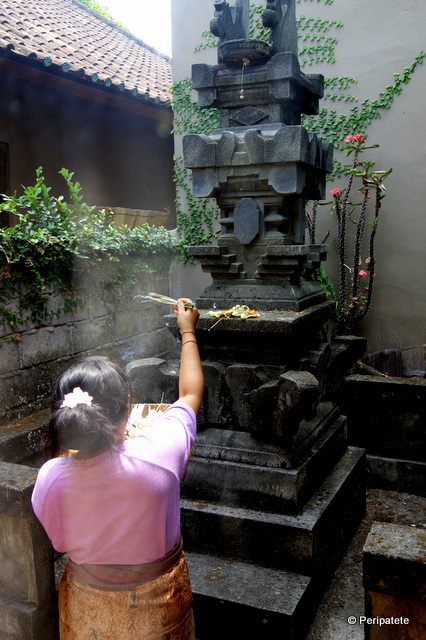 My house was going to undergo a serious cleansing, Balinese Hindu style, including all the requisite offerings and prayers. Amen: Just what the safety-doctor ordered. There were errands and responsibilities for Ayu to attend to first; zipping down to the back of the temple where she’d line up to fill the water gallon with spring water; cooking up a storm – including preparing a few dishes such a scrumptious tempeh mixture lightly sauteed in virgin coconut oil; washing dishes, cleaning the bathroom and mopping the floors. Then, when all the regular cleaning was done, Ayu was ripe ‘n ready for the cleansing rituals. She wrapped herself into a sarong and sash, re-arranged her bun, straightened her top and lit the bunch of incense sticks until their sweet aroma permeated the entire living area and kitchen. 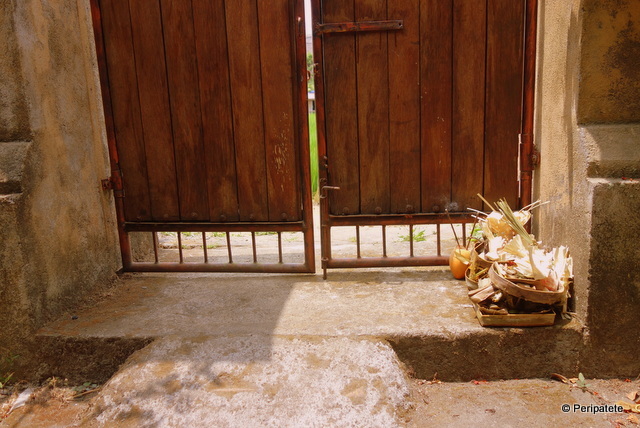 Out she went, first to the altar on the side, placing offerings, dipping petals in holy water, using waving hand gestures to bless and thank the benevolent spirits – asking them to protect this home. The front door and entryway was next. I leaned back, watched and said a little prayer myself. When all was done, the bulk of the offerings that had not yet been placed and blessed elsewhere, were laid down on the ground, right at the front gates. Incense smoke still wafted, its plume meaningfully blocking the path of those daring malevolent spirits, spreading protection throughout the compound. Ayu unfurled the sarong, folded all into her purse, picked up her basket and she was on her way. 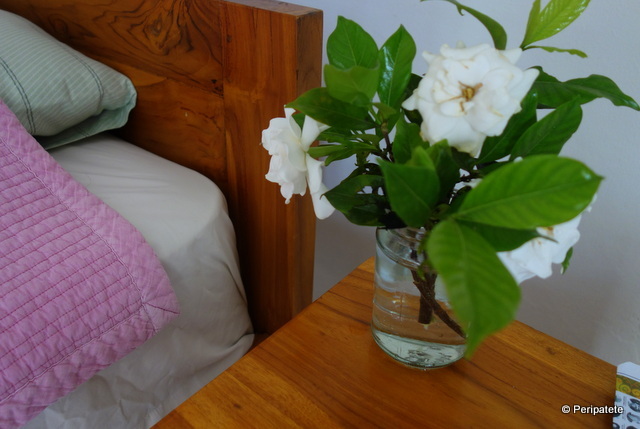 I turned around, went inside and, in my bedroom, I found a jar with fragrant jasmine blossoms that Ayu had arranged. Ahhh…bless her! Sorry to hear that someone was in your home without permission. I can imagine that would be pretty scary. I’m glad you’re feeling a bit better now.